The Eleusinian Mysteries (Greek: Έλευσίνια Μυστήρια) were initiation ceremonies held every year for the cult of Demeter and Persephone based at Eleusis, in ancient Greece. Of all the mysteries celebrated in ancient Mediterranean world, these were held to be the ones of greatest importance. (For example, Cicero writes: "For among the many excellent and indeed divine institutions which your Athens has brought forth and contributed to human life, none, in my opinion, is better than those mysteries. For by their means we have been brought out of our barbarous and savage mode of life and educated and refined to a state of civilization; and as the rites are called 'initiations,' so in very truth we have learned from them the beginnings of life, and have gained the power not only to live happily, but also to die with a better hope," Cicero, Laws II, xiv, 36.) The Eleusinian myths and mysteries began in the Mycenean period (c. 1500 B.C.E. ), became a major festival during the Hellenistic era, and later spread to Rome. The rites, cultic worships, and beliefs were kept secret as they were believed to unite the worshiper with the gods and included promises of divine power and rewards in the afterlife. In the Gregorian calendar, the date of the celebration of the Eleusinian Mysteries has been estimated to have begun on September 14. The Eleusinian Mysteries celebrated Persephone's return, for it was also the return of plants and of life to the earth. Persephone had gone into the underworld (underground, like seeds in the winter), then returned to the land of the living: Her rebirth is symbolic of the rebirth of all plant life during Spring and, by extension, all life on earth. 2.3 Two Eleusinian Mysteries, the "Greater" and the "Lesser." Eleusis (modern-day Elefsina) is a small town located about 30 km SW of Athens. In ancient times, it was an agricultural town, producing wheat and barley. The Eleusinian Mysteries were based on a legend concerning Demeter, the goddess of life, agriculture, and fertility. According to the Greek myths, Demeter's daughter, Persephone, was gathering flowers with friends one day, when she was seen by Hades, the god of death to his underworld kingdom. Distraught, Demeter searched high and low for her daughter. However, in her distress, she neglected her duties; this caused a terrible drought in which the people suffered and starved. Only after consulting Zeus, was Demeter able to reunite with her daughter and the earth was returned to its former verdure and prosperity: the first spring. Before allowing Persephone to return to her mother, Hades gave her seeds of a pomegranate. As a result, Persephone could not avoid returning to the underworld for part of the year. According to the prevailing version of the myth, Persephone had to remain with Hades for four months and then stay above ground with her mother for a similar period. This left her the choice of where to spend the last four months of the year and since she opted to live with Demeter, the end result was eight months of growth and abundance to be followed by four months of no productivity. These periods correspond well with the Mediterranean climate of Ancient Greece. The four months during which Persephone is with Hades correspond to the dry Greek summer, a period during which plants are threatened with drought. After the first rains in the fall, when the seeds are planted, Persephone returns from the Underworld and the cycle of growth begins anew. The Mysteries are believed to have begun around 1500 B.C.E., during the Mycenean Age. The lesser mysteries were probably held every year; the greater mysteries only every five years. This cycle continued for about two millennia. In the Homeric Hymn to Demeter, King Celeus is said to have been one of the first people to learn the secret rites and mysteries of her cult, as well as one of the original priests, along with Diocles, Eumolpos, Polyxeinus, and Triptolemus, Celeus' son, who had supposedly learned agriculture from Demeter. Under Pisistratus of Athens, the Eleusinian Mysteries became pan-Hellenic and pilgrims flocked from Greece and beyond to participate. Around 300 B.C.E., the state took over control of the Mysteries; they were specifically controlled by two families, the Eumolpidae and the Kerykes. This led to a vast increase in the number of initiates. The only requirements for membership were a lack of "blood guilt," meaning having never committed murder, and not being a "barbarian" (unable to speak Greek). Men, women, and even slaves were allowed initiation. The outline below is only a capsule summary; much of the concrete information about the Eleusinian Mysteries was never written down. For example, only initiates knew what the kiste, a sacred chest, and the kalathos, a lidded basket, contained. The contents, like so much about the Mysteries, are still unknown, and probably will be forever. However, one researcher writes that this Cista ("kiste") contained a golden mystical serpent, egg, a phallus, and possibly also seeds sacred to Demeter. Two Eleusinian Mysteries, the "Greater" and the "Lesser." According to Thomas Taylor, "the Lesser Mysteries signified the miseries of the soul while in subjection to the body. The Greater Mysteries obscurely intimated, by mystic and splendid visions, the felicity of the soul, both here and hereafter, when purified from the defilements of a material nature and constantly elevated to the realities of intellectual [spiritual] vision." He also quotes Plato: "The design of the mysteries was to lead us back to the principles from which we descended, that is to a perfect enjoyment of intellectual [spiritual] good." The Lesser Mysteries were held in Anthesterion (March) but the exact time was not always fixed and changed occasionally, unlike the Greater Mysteries. The priests purified the candidates for initiation (myesis). They first sacrificed a pig to Demeter then purified themselves. The Greater Mysteries took place in Boedromion (the first month of the Attic calendar, falling in late Summer) and lasted ten days. On 15th Boedromion, called Agyrmos, the hierophants (priests) declared prorrhesis, the start of the rites, and carried out the "Hither the victims" sacrifice (hiereia deuro). The "Seawards initiates" (halade mystai) began in Athens on 16th Boedromion with the celebrants washing themselves in the sea at Phaleron. On 17th Boedromion, the participants began the Epidauria, a festival for Asklepios named after his main sanctuary at Epidauros. This "festival within a festival" celebrated the hero's arrival at Athens with his daughter Hygieia, and consisted of a procession leading to the Eleusinion, during which the mystai apparently stayed at home, a great sacrifice, and an all-night feast (pannychis). The procession to Eleusis began at Kerameikos (the Athenian cemetery) on the 19th Boedromion, from where the people walked to Eleusis, along what was called the "Sacred Way," swinging branches called bacchoi. At a certain spot along the way, they shouted obscenities in commemoration of Iambe (or Baubo), an old woman who, by cracking dirty jokes, had made Demeter smile as she mourned the loss of her daughter. The procession also shouted "Iakch' o Iakche!" referring to Iacchus, possibly an epithet for Dionysus, or a separate deity, son of Persephone or Demeter. Upon reaching Eleusis, there was a day of fasting in commemoration of Demeter's fasting while searching for Persephone. The fast was broken while drinking a special drink of barley and pennyroyal, called kykeon. Then on 20th and 21st Boedromion, the initiates entered a great hall called Telesterion; in the center stood the Anaktoron ("palace"), which only the hierophantes could enter, where sacred objects were stored. Here in the Telesterio, the initiates were shown the sacred relics of Demeter. This was the most secretive part of the Mysteries and those who had been initiated were forbidden to ever speak of the events that took place in the Telesterion. The penalty was death. Athenagoras of Athens claims that it was for this crime (among others) that Diagoras had received the death penalty. As to the climax of the Mysteries, there are two modern theories. Some hold that the priests were the ones to reveal the visions of the holy night, consisting of a fire that represented the possibility of life after death, and various sacred objects. Others hold this explanation to be insufficient to account for the power and longevity of the Mysteries, and that the experiences must have been internal and mediated by a powerful psychoactive ingredient contained in the kykeon drink. Following this section of the Mysteries was the Pannychis, there was an all-night feast accompanied by dancing and merriment. The dances took place in the Rharian Field, rumored to be the first spot where grain grew. A bull sacrifice also took place late that night or early the next morning. That day (22nd Boedromion), the initiates honored the dead by pouring libations from special vessels. The Roman emperor Theodosius I closed the sanctuaries by decree in 392 C.E., as part of his effort to suppress Hellenistic resistance to the imposition of Christianity as a state religion. The last remnants of the Mysteries were wiped out in 396 C.E., when Alaric, King of the Goths, invaded accompanied by Christians "in their dark garments," bringing Arian Christianity and desecrating the old sacred sites. The closing of the Eleusinian Mysteries in the fourth century is reported by Eunapios, a historian and biographer of the Greek philosophers. Eunapios had been initiated by the last legitimate Hierophant, who had been commissioned by the emperor Julian to restore the Mysteries, which had by then fallen into decay. There are many paintings and pieces of pottery that depict various aspects of the Mysteries. 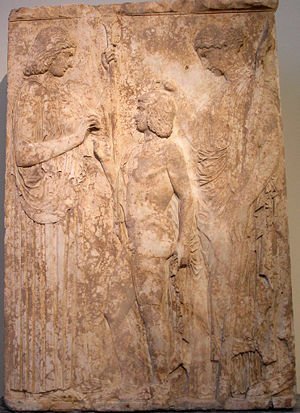 The Eleusinian Relief, from late fifth century B.C.E., stored in the Archaeological National Museum in Athens is a representative example. Triptolemus is depicted receiving seeds from Demeter and teaching humankind how to work the fields to grow crops with Persephone holding her hand over his head to protect him. Vases and other works of relief sculpture, from the fourth, fifth, and sixth centuries B.C.E., depict Triptolemus holding an ear of corn, sitting on a winged throne or chariot, surrounded by Persephone and Demeter with pine torches. The Niinnion Tablet in the same museum depicts Demeter, followed by Persephone and Iacchus, and then the procession of initiates. Then, Demeter is sitting on the kiste inside the Telesterion, with Persephone holding a torch and introducing the initiates. The initiates each hold a bacchoi. The second row of initiates were led by Iakchos, a priest who held torches for the ceremonies. He is standing near the omphalos while an unknown female (probably a priestess of Demeter) sat nearby on the kiste, holding a scepter and a vessel filled with kykeon. Pannychis is also represented. In Shakespeare's The Tempest, the masque that Prospero conjures to celebrate the troth-pledging of Miranda and Ferdinand echoes the Eleusinian Mysteries, although it uses the Roman names for the deities involved—Ceres, Iris, Dis, and others—instead of the Greek. Some scholars have suggested that the power of the Eleusinian Mysteries came from the kykeon's functioning as a psychedelic agent. This was argued most extensively in The Road to Eleusis (1978). Barley may be parasitized by the fungus ergot, which contains the psychoactive alkaloids lysergic acid amide (LSA), a precursor to LSD and ergonovine. It is possible that a psychoactive potion was created using known methods of the day. The initiates, sensitized by their fast and prepared by preceding ceremonies, may have been propelled by the effects of a powerful psychoactive potion into revelatory mind states with profound spiritual and intellectual ramifications. While Wasson et al. have presented evidence supporting their view that a potion was drunk as part of the ceremony, the exact composition of that agent remains controversial. Modern preparations of kykeon using ergot-parasitized barley have yielded inconclusive results, although Shulgin and Shulgin describe both ergonovine and LSA to be known to produce LSD-like effects. ('Note: Ergot is known to be highly toxic, and experimentation with ergot is strongly discouraged.) Terence McKenna argued that the mysteries were focused around a variety of Psilocybe mushrooms, and various other entheogenic plants, such as Amanita mushrooms, have also been suggested but at present no consensus has been reached. ↑ Antonia Tripolitis, Religions of the Hellenistic-Roman Age (Eerdmans Publishing Company, 2001). ↑ William A. Savage, Quest of the Soul: The Eleusinian Mysteries (Sunrise magazine, February/March 2006). ↑ Apollodorus, i. 5, 2. ↑ W. Smith, A Dictionary of Greek and Roman Antiquities (London, 1875). ↑ Kevin Clinton, "The Epidauria and the Arrival of Asclepius in Athens," in Ancient Greek Cult Practice from the Epigraphical Evidence, edited by R. Hägg (Stockholm, 1994). ↑ www.erowid.org, Tikhal:The Continuation. Retrieved April 21, 2008. ↑ Terence McKenna, Food of the Gods: Search for the Original Tree of Knowledge (Bantam Books, 1993). Moore, Clifford H. Religious Thought of the Greeks. 1916. Mylonas, George Emmanuel. Eleusis and the Eleusinian Mysteries. Princeton, NJ: Princeton University Press, 1961. Taylor, Thomas. A Dissertation on the Eleusinian and Bacchic Mysteries. 1791. This page was last modified on 14 September 2017, at 15:38.